Oppo has been gaining some notoriety as of late after the company got all buddy-buddy with Cyanogen, and if rumors about its upcoming Find 7 phone are true, they might be getting some more soon. 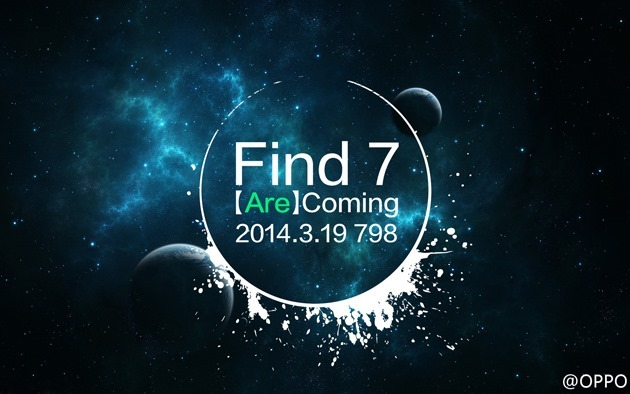 The company posted the photo below to Chinese Twitter alternative Weibo, tacitly confirming the announcement of the phone for March 19th. 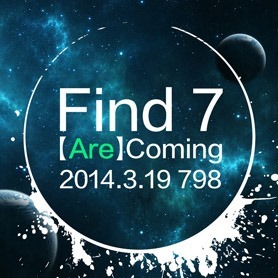 What's up with "Find 7 are coming?" According to Engadget, that's a surprisingly subtle hint that the Find 7 will be offered with two 5.5-inch screen resolution options: a standard 1080p model and a "2K" alternative, using a 2560x1400 LCD panel from JDI. An anonymous source says that there may be other differences between the high-end and midrange models. It's in interesting choice, and a smart one - why not save the R&D necessary for a completely new body and a redesigned interior? Consider all this a chasing after the wind until we get some more concrete sources, but since Oppo seems more than inclined to try out new hardware ideas, it sounds plausible at the very least. The company is making some sincere efforts to expand outside of Asia as well, so it's entirely possible that we could see a bigger American presence for the next Find flagship. We'll find out (sorry) in about five weeks.